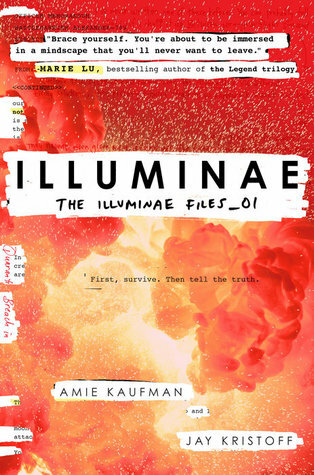 The Illuminae files are a compilation of documents sought after by BeiTech to see if there’s any evidence of their treacherous deeds. The Illuminae Group is basically Kady on a mission. Anyway, Ezra and Kady’s planet is attacked by BeiTech. They get put on separate ships. Kady’s mum’s ship gets destroyed and the refugees infect Ezra’s ship with a virus. People from Ezra’s ship escape to Kady’s ship. There’s a lot of ship hopping. Ezra “dies”. Kady helps AIDAN beat BeiTech. Ezra lives. It’s revealed that Ezra’s mother is the head of BeiTech. Leanne’s not the nicest mother. The book takes place in the future. It’s set in 2575. Kerenza is attacked by a super evil company called BeiTech. Kerenza is a mining planet where Ezra and Kady live. Ezra and Kady were a thing but they broke up. Kady and Ezra escape Kerenza on two separate ships. Kady is on the Hypatia and Ezra is on the Alexander. Before the Alexander can leave the sector, its wormhole is destroyed by a BeiTech ship called the Lincoln. So the Alexander is screwed and the Hypatia can’t really leave it. The ships have to get to the Heimdall waypoint before the Lincoln does. Kady hacks into the fleet’s security system and this is noticed by Byron Zhang of the Hypatia. Byron is hella impressed by Kady’s hacking skills and the two buddy up and look into the shady business together. The UTA military recruits Ezra. The Alexander blows the Copernicus up. Kady’s mum is killed. AIDAN did this to protect the fleet from an outbreak, because the people on the Copernicus were infected with a virus and it was spreading rapidly. AIDAN orders Ezra and his team to destroy some ships that are launching from the Copernicus. Instead, Ezra and his team bring the people aboard the Alexander. Two members of Ezra’s team are executed for disobedience. Understandably as well because, I repeat, the people aboard the Copernicus were INFECTIOUS. Kady gets into contact with Ezra. Kady finds out that AIDAN blew up the Copernicus on its own. The Alexander shuts AIDAN tf down. For now. I guess they can’t really have artificial intelligence going around blowing people up, even if it does kind of make sense. Byron goes to the Alexander to try to get AIDAN back online so it can defend them from the Lincoln, which has been coming after them for ages. Kady and Byron work on a computer programme that will shut down the Lincoln’s engines. AIDAN comes back online and delivers the code to the Lincoln. The refugees from the Copernicus who were under quarantine (the ones that Ezra brought back) are let out by AIDAN and they go on a killing spree. Byron escapes the chaos and tries to shut AIDAN down again. People from the Alexander escape onto the Hypatia and they are placed in quarantine. There’s a lot of quarantine going on. The Hypatia tries to leave the Alexander behind but AIDAN stops it. Kady steals a shuttle and goes to rescue Ezra from the Alexander. She thinks she’s about to find him on the ship when it’s revealed that AIDAN has been tricking her – Ezra actually died a few days ago. AIDAN wanted her on the Alexander so she could fix the ship. Kady says she’ll try to fix the Alexander if AIDAN allows the remaining crew onto the Hypatia. Kady has to fight off a bunch of infected people. She locks herself in the control centre and fires nukes on the Lincoln as it catches up. The Lincoln fires back but is ultimately destroyed because HEROES. AIDAN helps Kady into an escape pod before she can die of radiation poisoning… or of a fiery explosion when the Alexander explodes. Kady is rescued by the Hypatia. It’s revealed that Ezra is actually alive and was in quarantine on the Hypatia pretty much the entire time. Kady becomes the Illuminae Group. She is the one who has prepared the files for the BeiTech director – who is also Ezra’s mother. Her name is Leanne. Leanne wants to know where Ezra is but Kady keeps this a secret. THIS WAS THE BEST BOOK I’VE READ.Thanks for the recaps,my mind was all over the place while reading this- I mean this book is so complicated and mindblowing! Totally hyped for more! !